On New Year’s Eve, a man reached across the counter at a St. Petersburg McDonald’s to grab a young cashier by the collar after not finding any straws in the lobby due to a city straw ban. 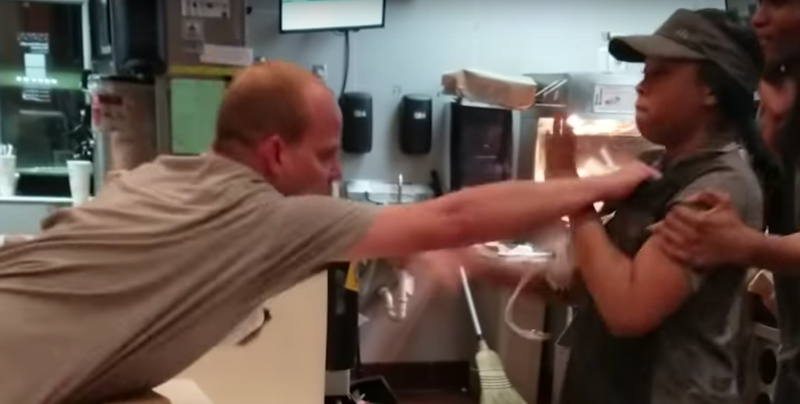 The now-viral video shows the cashier ably defending herself (with what Takeout sister site The Root dubbed Filet-O’-Fist sandwiches) before a manager finally intervenes. The man was eventually arrested on two charges of battery, as he kicked another female employee in the stomach on his way out the door. The strike organizers are affiliated with the wage activist group Fight for $15, and are pushing for “McDonald’s to ‘establish store security protocols, and provide protection and a voice on the job for its predominantly Black and Latinx women workforce,’ according to a news release.” The cashier stated through her attorney that “black women are too often left to fight for themselves.” Fight for $15 has in the past demonstrated and filed federal complaints over sexual harassment of McDonald’s workers. Company spokesman Khim Aday said in a statement that McDonald’s “is in the process of offering employees counseling through an employee assistance program” and has hired an external investigator to investigate the assault and how the company should respond to future incidents.